The GeekVape Zeus RTA is uniquely designed with user-friendly performance in mind, incorporating a postless single-coil deck coupled with groundbreaking 3D airflow system that works perfectly with watertight top airflow design. It is creatively constructed with topnotch machining and gorgeous design elements. It measures 25mm in diameter, and it can hold a maximum of 4ml. It features an expedient threaded top-fill system that allows you to enjoy your favorite e-juice. As a 2-post deck, the GeekVape Zeus RTA provides 3mm terminals that make coil insertion using side-mounted hex screws easier. 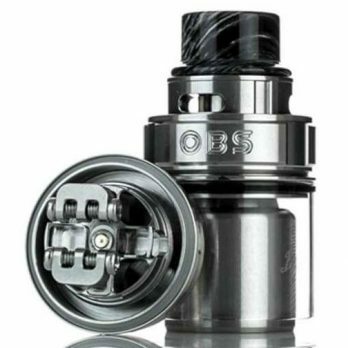 The product includes one Zeus RTS, one 510 Drip Tip Adapter, two Prebuilt Coils, one Spare Glass Tube, one 520 Drip Tip Set, one T-Tool, and an instructional manual. The GeekVape Zeus RTA is available in four colours: Black, Blue, Gunmetal, and Stainless steel. This means you can get a device that bears your favorite color. The GeekVape Zeus RTA is a gorgeous tank. The simple lines and stunning Zeus inscription on the inner chamber are matched with a wide drip tip and unobtrusive airflow control ring. 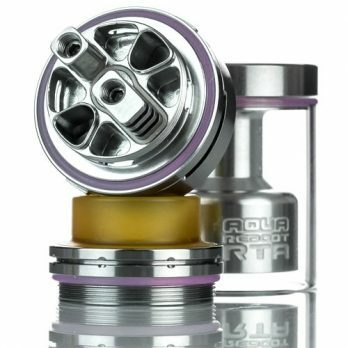 The RTA also has an easy to remove top cap, making refilling a hassle-free task. It supports both 810 and 510 drip tips. The cutting-edge 3D airflow system is the highlighting feature that sets the GeekVape Zeus RTA apart from its competitors. This device leverages a top airflow control that directs air into the e-juice tank where it is directed around the base into the inner chamber. The deck posts have strategically positioned holes that allow air to penetrate the deck from the sides and directly hit the installed coil. The side-airflow set-up enables this RTA tank to deliver a smoother and less blustery vape. The GeekVape Zeus RTA will surpass your expectation as far as cloud production and flavor quality is involved. By leaving the airflow wide open and increasing the wattage, this RTA will deliver impressive cloud production with little turbulence. The airflow directs air to the right spots on your coil, giving you a wonderful flavor. Another feature that gives the GeekVape Zeus RTA a competitive edge over other RTAs in the market is its leak-proof capability. Due to this leak-proof ability, you can carry the RTA everywhere you go – you can put it in your pockets, backpack, or even your grocery bag. If you want to keep the quality of flavor and clouds at a topnotch level, you must clean this RTA tank regularly. Thanks to its easy to disassemble structure, cleaning the GeekVape Zeus RTA is a stress-free task. The GeekVape Zeus RTA has adopted a minimalist design, making it suitable for both newbies and veterans in the vaping world. Its beautiful design and leak-proof construction will give you peace of mind every time you take it out and use it. This RTA has impeccable flavor and cloud production is remarkable as well.